I actually got this dress in Iowa a couple months ago for only $13, but never got any pictures in it the only other time I've worn it. I definitely wasn't going to get anything from Francesca's that trip, but I couldn't resist trying this one, and when the saleswoman told me it was on sale for that cheap, I had trouble passing it up. It's surprisingly really great quality, and the shape is flawless. Speaking of purchases I shouldn't have made in the past few months, but got peer pressured into, these oxfords were one of the only things I bought during spring break. They're Opening Ceremony, and I found them at Wasteland in L.A. for way cheaper than they should have been. I've always wanted something from Opening Ceremony, but a few hundred bucks for shoes? Not happening. $30 for a used pair in perfect condition is much more my language. Don't forget to enter my James Society giveaway to win a palm tree clutch! I can't say that there's much interesting happening in my life at the moment other than work, school, hanging out with friends, and TV. I kind of watched "Veronica Mars" nonstop (I didn't hang out with friends on Saturday night so I could watch more) and I might have already finished it and the movie. Obsessed is an understatement. I don't know how I could possibly watch anything else right now since nothing will compare for a while. Your polka dot dress is way precious! *___* Black and white polka dots have to be the most versatile print. May your week be pleasant!! Oh, adorable shoes, adorable look! Ugh, I still haven't watched the VM movie. Need to do now that it is our spring break! I feel like I already relate to you because I'm too a Southern California native going to college away from home, hehe! 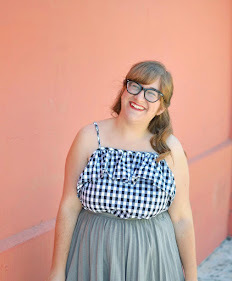 :-) SO obsessed with your retro and girly look! Love how you paired your dress with the pastel blue, it's definitely spring ready! And waitttt, I cannot believe you scored those lovely Opening Ceremony shoes for only a mere $30! I've actually never been to Wasteland before but I've heard so many people rave about it! How do you like it? I definitely need to stop by next time I'm home! Speaking of Veronica Mars, I really need to hop on that train, hehe. I absolutely love Kristen Bell, and my friends have been egging me to give VM a watch! This dress is super cute and what a bargain! You can't go wrong with a polka dot dress anyway. You could wear that a billion different ways. I love it styled with a simple cardigan and oxfords. Cute dress and only $13?! What a great find! :D Such a lovely outfit! Oh I adore that dress! I wish I could have a week of warm weather. Hopefully you'll get some nice spring weather in your neck of the woods soon!